By Zack Quaintance — It’s one of those rare weeks where the majority of our top picks our superhero books. This doesn’t happen all that often, but we just had to give credit where credit is in this feature for Top Comics to Buy for April 17. We will say, though, that the superhero runs we’re featuring this week all have their best foot forward, be it Naomi offering some satisfying insights into its protagonist’s mysterious background or Guardians of the Galaxy pushing ahead with one of the best ongoing cosmic stories told with superhero characters in some time. There’s a lot to like this week. Oh yeah, and the creator-owned comic that absolutely stunned us last month, Little Bird, returns with its sophomore issue, which might just be even better than its first. Let’s take a look at all of that and more! Why It’s Cool: Many a comic promises a giant and satisfying reveal that has major ramifications for whatever shared superhero universe it happens to be part of, but with a rich emotional core driving it, Naomi #4 is actually poised to deliver. This is just such a wonderful series, with all parties involved—writers Brian Michael Bendis and David F. Walker, artist Jamal Campbell, and letter Abbott—are bringing a set of fantastic disparate elements to this story, and bringing them in a way that coheres into something truly special. Introducing a character with a mysterious origin that the character themselves is unaware of is tricky business in comics these days, given how often it’s been done. What we’re getting from Naomi, however, is an answer that could only come from the intricate corners of the DC Universe, told in a way that could give us major new players in that universe moving forward. It’s just really well done, all around, and fans of DC Comics should be very excited about all of it. Check out our full Batman #69 review! The Dark Knight is breaking through the bad dreams and coming out the other side. But is he ready for the culprit waiting through the veil of terror? And what lasting effects might this whole ordeal have on Bruce Wayne's psyche? With artist Yanick Paquette (WONDER WOMAN: EARTH ONE) jumping on board to tackle the art, "Knightmares" comes to a shocking close. This will be the strangest issue yet-a no-holds-barred journey through Batman's psyche via the inner workings of Arkham Asylum, setting up the next big chapter of Tom King's epic BATMAN tale. Batman's future starts now! Why It’s Cool: Yanick Paquette is one of the best artists who does superhero work for DC, and his one-shots, stand-alones, and fill-in issues are always welcomed. His contributions are so welcomed here, in fact, that I just can’t imagine this issue happening without his linework, colored to perfect by the always-great Nathan Fairbairn. This issue also stands to start doling out the meaning and clarity from the half dozen or so psyche-heavy stories from this Knightmares story arc. This entire Tom King Batman run has in many ways been a deep dive into the titular characters psyche, and this story arch just goes directly for it. If this issue is any indication, it stands to yield satisfying results. THE DARK GUARDIANS! The Dark Guardians, a new cosmic hit squad made up of the most powerful and cunning people in space, are going to kill Gamora. It's time for the new Guardians of the Galaxy to saddle up! Why It’s Cool: This run of top-tier Marvel cosmic storytelling has been cool, dating back to its start, when it used to be called Thanos. As I’ve written before, in both reviews and this weekly previews piece, Guardians of the Galaxy by Donny Cates, Geoff Shaw, Marte Garcia, and VC’S Cory Petit is essentially a continuation of one of the best Thanos stories ever told, albeit it one with a shift toward the focus on its titular team. Despite being a scant three issues old, this run has already introduced two compelling new concepts: Thanos is a nigh-elemental force due to reincarnate inside a new vessel, and there are now a set of Dark Guardians out to counter the regular Guardians efforts. In this case, those efforts involve finding and addressing the new Thanos versus the Dark Guardians push to straight murder Gamora, who they’ve pegged as the obvious choice by using some questionable logic. This story has been great so far, and every indication is that that greatness will continue in Guardians of the Galaxy #4. Why It’s Cool: Upon its debut last month, Little Bird #1 established this book as our favorite wholly original new series of 2019. 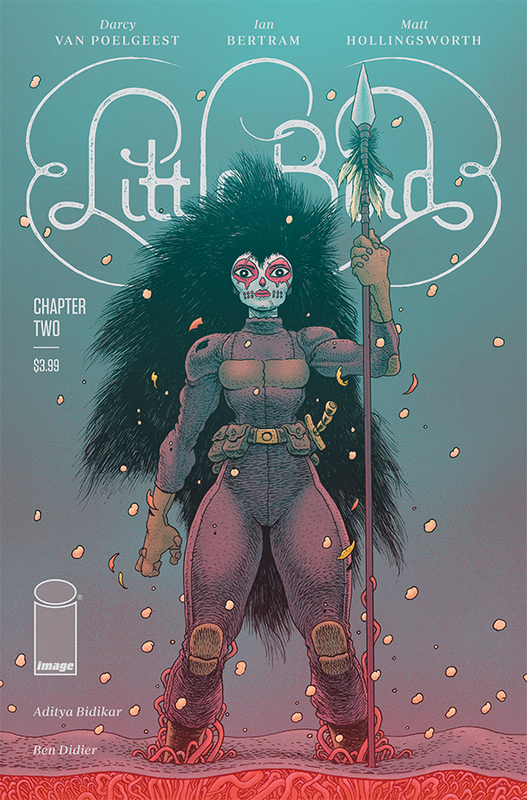 Little Bird #2 not only strengthens that position, but it actually pushes the comic into some new territories that if used properly moving forward could make this story even better. The first issue dealt in ideas of religion, rebellion, and national identity. The second issue introduces the very nature of consciousness to the thematic fray. This could all be a lot to juggle, and one wouldn’t be surprised if the narrative buckled under it. That’s not the case at all here, though. The team of Ian Bertram and Matt Hollingsworth renders everything in clear and intricate detail, infusing a layer of imagination to the designs and concepts that are unparalleled in their scope, ambition, and execution. This book comes highly recommended. Matt Kindt's final X-O issue! This is it! This is Matt Kindt's final issue of his Eisner Award-nominated, critically acclaimed run on X-O MANOWAR. "HERO" Part 4, the conclusion! X-O Manowar takes the final battle against the galaxy's baddest bounty hunters into space to decide the ultimate fate of the universe. Perfect for fans of interstellar sci-fi adventure stories. Why It’s Cool: We’re going to have a great contributed piece about this run soon, but I’ll just say here and now that Matt Kindt’s XO-Manowar has been one of the greatest Valiant runs of all time, driven by a mixture of character-based storytelling and incredible artistic collaborators, with Tomas Giorello and Andrew Dalhouse leading the way. This run has certainly been building toward this finale too, reaching that rarified ground wherein we’re stoked to see how they end it but sad that it has to go. There is no better way for a series to go out. Check back to the site later this week for reviews of Batman #69, Xena the Warrior Princess #1, and Guardians of the Galaxy #4...plus a broader look at Tom King’s Batman, The Boys Pt. 2, and more!